This Car wash is awesome! I do recommend this car wash to all my family and friends. Cool PLACE!! Love the price! and it is the only car wash that can take my lowered MiNi! 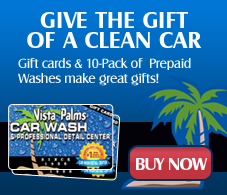 "Vista Palms", "Vista Palms Professional Detail Center" (and palm trees logo), and "Vista Palms Car Wash + Detail Center" (and palm tree logo) are registered service marks of Vista Palms Car Wash, Inc. ©2015 Vista Palms Car Wash, Inc.